Built for dedicated use with the brand’s rekordbox dj software. Pioneer DJ has unveiled the DDJ-800, a lightweight dual-channel controller with multiple “firsts”, including LCD on-jog displays and a Feedback Reducer feature in the rekordbox dj software. If the design layout on the new controller seems familiar, that’s because it harks back to that of Pioneer DJ’s DDJ-1000. The brand received plenty of positive feedback surrounding that design, so it decided to keep things similar, but in a more portable body: The DDJ-800 weighs in at just 1.3kg. Moving on to the new features, you’ll notice the new device features HD LCD screens fitted at the center of each jog wheel – a first for the brand’s two-channel controllers. These screens let you conveniently view track waveforms, information on playback time and BPM. They also aid you in gauging the current playback position’s distance to Hot Cue/Loop points, and even display full artworks of tracks being played. 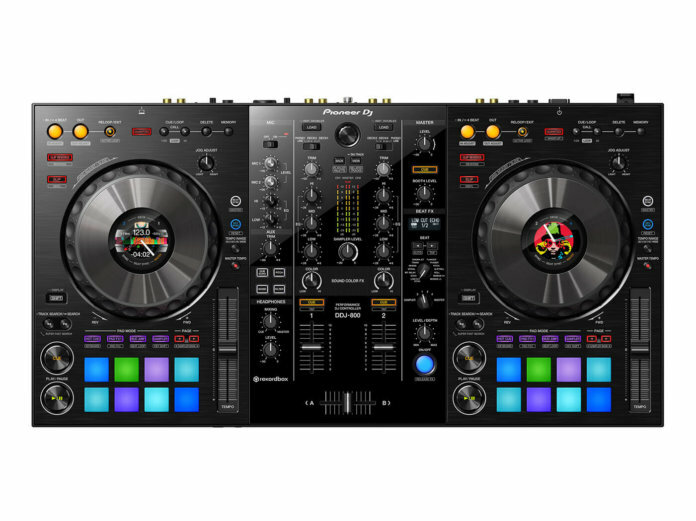 The DDJ-800 is also designed to support new features in version 5.5 of rekordbox dj. One of these is Feedback Reducer, which “instantly detects the ‘howling’ frequency of feedback and brings it down”, according to the brand. Other cool features on the DDJ-800 include Feeling Adjust and FX sets. The former can be used to set jog wheel resistance, letting you customise scratching weight. The latter comprises Sound Color and Beat FX packs – taken from the DJM mixer series – which can be deployed to spice things up. Price $899. For a full list of features, head over to pioneerdj.com.